Bratislava is the capital city of Slovakia. It has history, castles, charm, and interesting food. Because of its proximity to Vienna, many just visit Bratislava in a day trip. However, in retrospect I wish we would have spent more time in the city and exploring the rest of the country of Slovakia. Not only do I have a sister in Slovakia, but the small part of the country we saw was amazing. Bratislava sits on the border of Slovakia and Austria, about an hour and a half from Vienna. The two cities are so close that you could easily take the train from Vienna to Bratislava just for the day. On this particular vacation, we were roadtripping through Europe, so we didn’t take the train. However, it is perhaps the most popular means of travel between the two cities. We left Vienna early in the morning with plans to visit Bratislava for a day before heading to our next destination, Brno, Czech Republic, that evening. 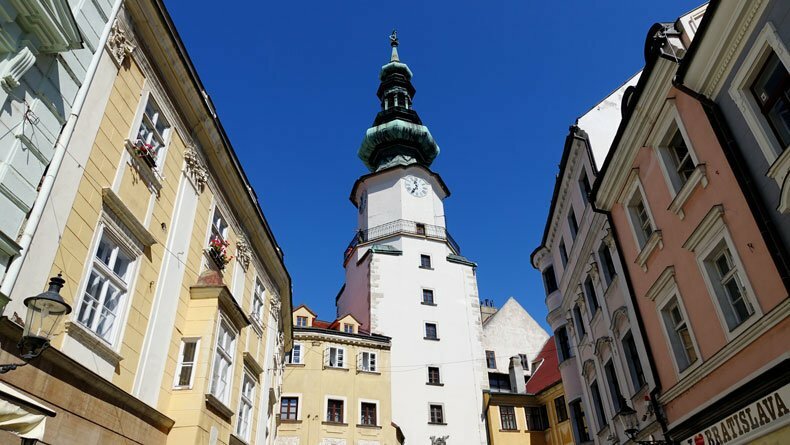 Although I would encourage you to spend at least one night in Bratislava, if your time is limited, you can easily experience much of Bratislava in a day. When we arrived in Bratislava, we started out in Old Town and walked around exploring. Like many of the cities in Europe, the buildings in Old Town Bratislava are beautiful and the architecture will transport you back in time. We walked into some of the souvenir shops and beautiful churches, including the popular St. Martin’s Cathedral. Take some time and relax in the town square and enjoy an authentic Slovakian meal. Traditional Slovakian food was different than American cuisine, to say the least, but yummy! A must try is sheep cheese. It has a very distinct flavor and is in several popular Slovakian dishes, including Bryndzové Halušky, the national dish of Slovakia, which is similar to gnocchi. Not a meat eater? Don’t worry! There are plenty of vegetarian and vegan options in Bratislava, as well. 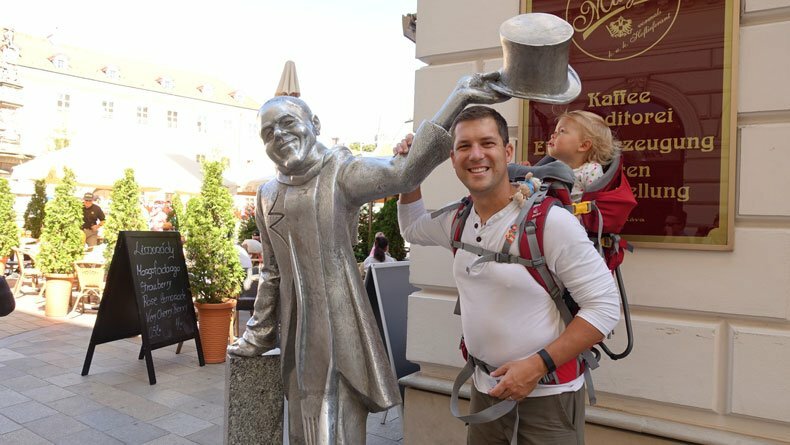 There are several quirky bronze statues in Bratislava that have become somewhat of a tourist attraction themselves. Man at Work, which is a statue of a smiling sewer worker coming out of a manhole, is perhaps the most famous and photographed of the Bratislava statues. As we explored Old Town we set out to find all of the iconic statues sprinkled around the area. You will literally just stumble upon these whimsical statues as you stroll through the town. Usually, there are crowds of people taking photos around the statues in Bratislava, so follow the crowds and you are bound to find them. 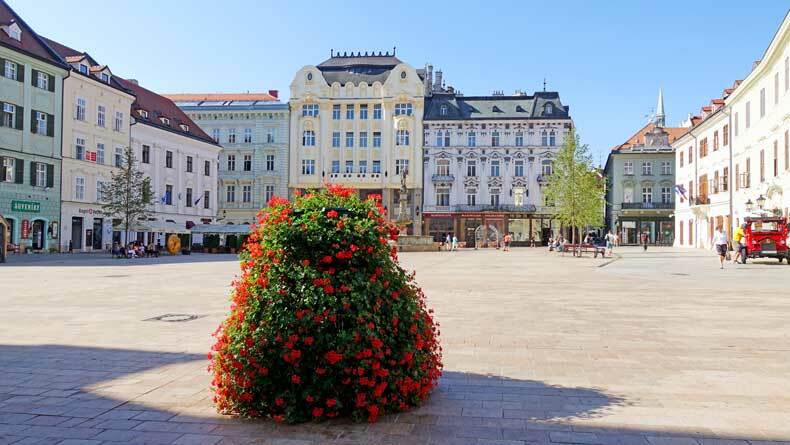 If you are visiting Bratislava with kids, finding the statues can be a fun treasure hunt that will keep your kids engaged and interested as you are sightseeing. We had fun taking silly photos and being tourists, which I think everyone should do from time to time. Bratislava Castle is just outside of Old Town perched up on a rocky hill. You will immediately notice the prominent castle as you drive into town. The square castle with its four corner pillars has been updated and renovated. It now houses various Slovak National Museum exhibitions. Touring the castle and museum’s exhibits will give you a good appreciation for the country’s history. Plus, you will get an exceptional view of the city! 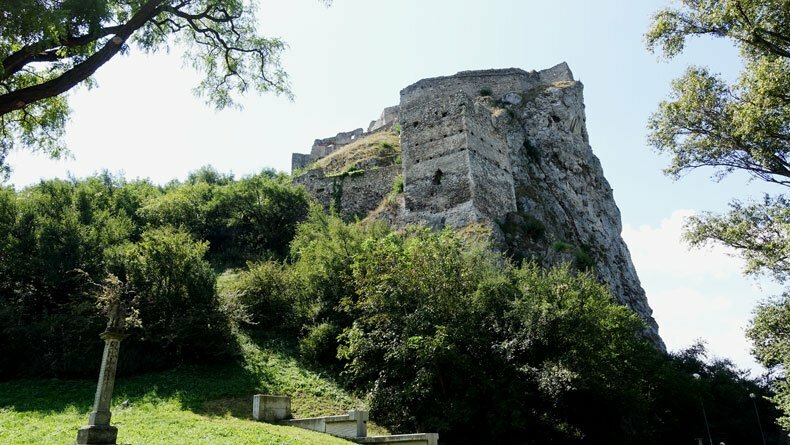 Devin Castle, which is about a 15 minute drive from Old Town, is a wonderful step back into ancient times and another attraction worth visiting in Bratislava. Believed to date back to the 5th century B.C, the well preserved ruins sit perched on a cliff overlooking the banks of the water where the Danube and Morava rivers meet. It’s a long, uphill hike to get to the castle from the parking lot but worth every step. Surrounding the castle and running along the river, is a paved walkway that is great for a stroll on a nice day. The castle costs approximately €4 a person to get in, but beware, they only take cash. We actually found several places through Czech Republic, Slovakia, and Poland that did not accept credit cards. It is definitely beneficial to take out cash in all three countries, which unfortunately all use different currency, too. We did find many of the places in Czech Republic and Poland would also accept euros, which is what they use in Slovakia and most of Europe, but not all of them. If I had this trip to do over again, we would have spent at least one night in Bratislava to give us more time to explore. The city is a great combination of beauty, history, and quirky character. Despite our short time there, Bratislava is definitely worth visiting, even if only for a day. While one day in Bratislava gave us a small sampling of the city, we didn’t get to see the rest of the country at all. I would love to venture further into Slovakia someday and especially check out the beautiful region of Northern Slovakia. 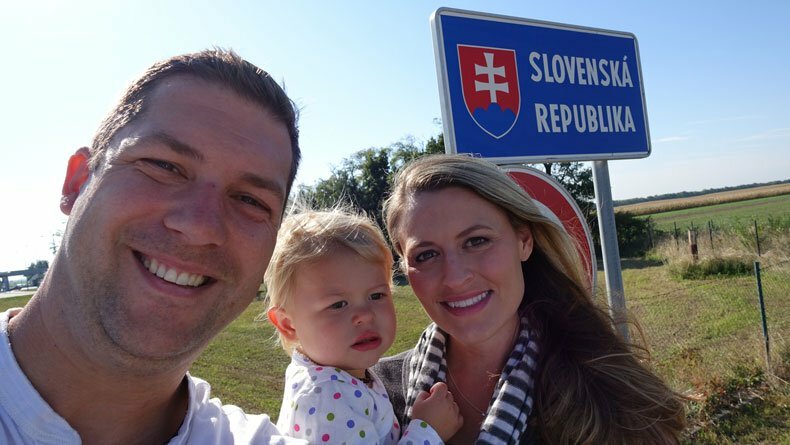 Having family in Slovakia, it is one of those countries I am confident I will return to multiple times. Although I did get to see my sister during our trip, I would have loved to visit her hometown of Bojnice, as well. That is definitely something on my bucket list for the future. 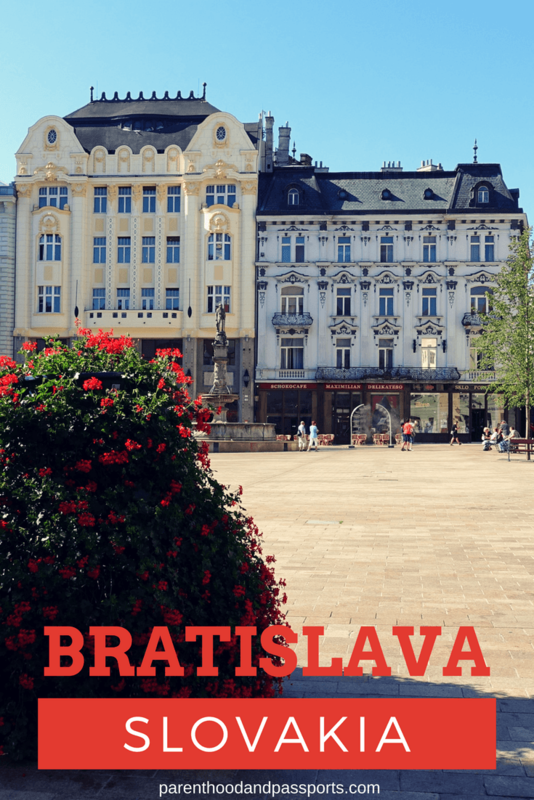 Have you visited Bratislava, Slovakia? Was a day in Bratislava enough or did you stay longer? Let us know in the comments below! A few years ago I went on a trip through Europe via train and we made a stop at Bratislava. It was only for a day and all we did was go to Tesco and eat a pizza. In hindsight I’m actually quite ashamed that we didn’t even give the city a chance! I’d love to go back one day, as a lot of the things you mention here I’ve since read about and am absolutely kicking myself for missing out on. Devin Castle in particular looks like somewhere I’d love to explore! And at only €4 entry you can’t go wrong really can you?! Devin Castle was definitely a highlight of our very quick visit. I’m a sucker for ruins and old castles. Wow, I absolutely love the layout of your site and your photos. I say that because I am an “artist” and those things just pop out to me immediately. You have a great eye for taking photos and your family is beautiful. As a newbie to traveling, Slovakia wasn’t even on my radar. Sometimes you grow up reading certain things about countries or not even hearing about them at all (in your circle) and you instantly put up barriers. I am not sure how many places I will get to see in my lifetime but I cannot believe how beautiful Bratislava looks like. I am sure these are just a tiny portion of what this place has to offer. Thank you for writing about it…I will probably spend the next hour reading up on this hidden gem. Thanks Anita! Slovakia has been a place I’ve wanted to visit since I was in high school and had an exchange student from there who lived with us. (The girl I refer to in the post as my sister.) I really think the country should get more credit because it is so beautiful. Oh wow I didn’t know it was so close to Vienna either. Two cities I really want to go to, well they’ll both be on my itinerary if I make plans to go to one that’s for sure! Your pictures are lovely, the statues look really neat–I’d also be trying to find them all and take pictures with them lol. And those colorful old buildings look so neat to go exploring around in. Thanks for all the tips! We really enjoyed walking around and exploring Old Town Bratislava. 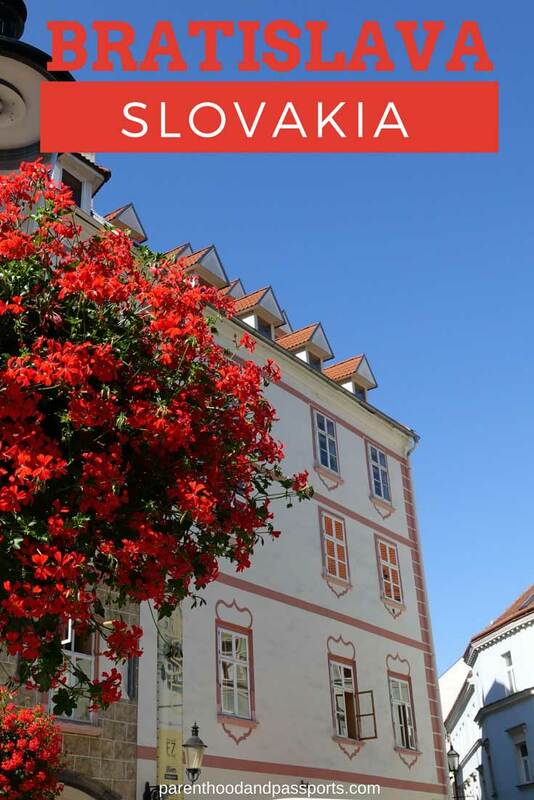 It is so pretty, and yes, SO close to Vienna that it’s a must visit if go to Austria. Bratislava looks beautiful! I love the historical buildings and all the colors throughout the town. 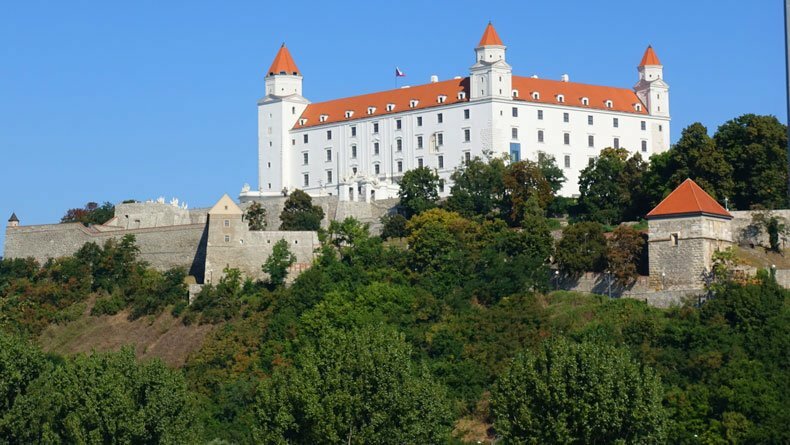 Bratislava Castle looks incredible – I love how it is perched on the hill and overlooks the town. And I would love to visit it just to learn about the country’s history through its museum. What a fun way to explore the town through your treasure hunt of statues! It looks like a lot of fun! 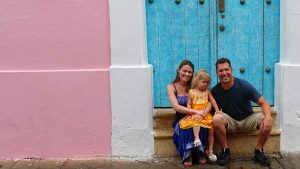 Since we travel with our toddler, we are always making up games and treasure hunts when we visit somewhere new. It’s just one of those silly things you do when you become a parent to keep things interesting for kids. So envious of this trip of yours! Have gone through the city only by train while going to Hungary. Old town looks fabulous and the Devin Castle sure looks mysterious! I have a soft spot for Bratislava. I visited Europe for the first time in 2006 as part of an Intrepid Travel group tour and we visited for the day from Vienna. Looks almost the same as it did in 2006. I also visited the Tatra Mountains in Slovakia as part of that trip and I highly recommend a visit (in the summer anyway). The Tatra Mountains look beautiful! I researched them and tried to fit them into our trip, but just didn’t have enough time. We are big skiers, so I really want to visit the Tatra mountains in winter and ski there. So far, we have only skied in the states. I visited Bratislava a few weeks ago and took lots of ‘silly tourist photos’ too at the places you mentioned. Unfortunately Devin Castle was closed when I visited but I took lots of pictures outside and even took the walk you mentioned which was beautiful. Although your daughter won’t remember this visit I’m sure when she’s older and sees the photos she’ll want to come back and see it again. It must have been a good exercise carrying her around the city and up to the castle! I am sad that I was so close to Slovakia and never got there after reading your post. The random statues would be awesome to track down as I love treasure hunts of that sort. The castles also look incredible just out of a fairy tale. Next time I travel to Vienna, one of my favourite cities, I will plan a day trip to Bratislava! What an awesome place to visit! Those castles are so charming and I’m just in love with those statues.